Custom rc60 Deluxe review | What Hi-Fi? 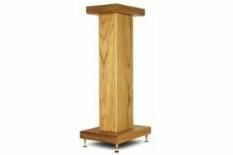 Nestled below 'headboards' and just above 'oak mirrors' on www.customspeakerstands.co.uk, you'll find these rather smart supports. It's fair to say that the firm isn't fully focused on the AV world, then. Fortunately this hasn't impacted on the quality. The wood finish – available in white oak, maple, ash, beech or pine – makes a pleasant change, with potential for above-average partner-approval ratings. Sonically we're happy, too. Bar a slightly bright treble at times, there's plenty to like in the detailed, lively sound our reference speakers produce on these steady supports. The fifth star only eludes the RC60s due to the brilliance of the Partington Super Dreadnoughts, which remain on another level at this price-point, especially in terms of scale and dynamics. But if you like the idea of wood as well as being able to have your stands tailor-made, then look no further than this online option.